Rice is a starchy grain used as a staple ingredient by more than half the world's population, largely in part due to its versatility and ability to adapt to any flavor and seasoning. Acting as a valued ingredient in almost any type of cuisine, rice has a chewiness and soft texture that adds substance to meals and complements multiple types of meal plans. There are different types of rice. 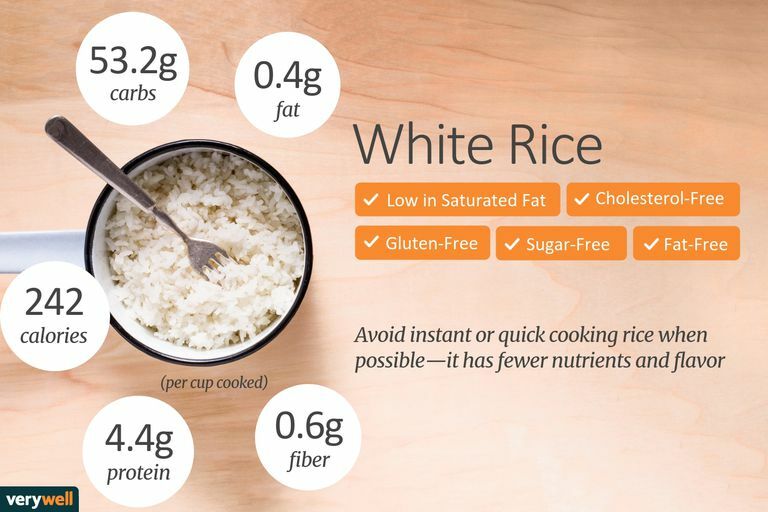 The calories and nutrition facts for white rice are different than for other types of rice. Consider different varieties to find the best variety for you. There are over 53 grams of carbohydrate in a single serving of white rice. Only a small amount of that carbohydrate comes from fiber. Most of it is starch and a small amount is sugar. Rice is considered a starchy source of carbohydrates. If you are counting carbohydrates for diabetes or a reduced-carbohydrate diet, you need to carefully measure your portion size. The glycemic index of white rice is estimated to be 73. The glycemic index of brown rice is estimated to be about 68. If you cook rice without adding any oil or butter, there is almost no fat in this dish. There are over four grams of protein in white rice if you consume a one-cup serving. Depending on the type of rice you choose, rice can serve as a good source of B vitamins, thiamin, niacin, riboflavin, fiber, and iron. Rice is also an excellent source of manganese and magnesium. Enriched rice has vitamins and minerals added back after it is refined. Rice is a gluten-free grain and so it has gained popularity among those who are avoiding wheat products. By selecting brown rice that is higher in fiber and limiting portion sizes, it can be part of a healthy diet. Many of the health benefits of rice come from the vitamins and minerals that it provides. The thiamin in rice is a B vitamin that helps with carbohydrate metabolism. Magnesium is the structural component of bones that assists in hundreds of enzyme reactions involved in the synthesis of DNA and proteins and is required for proper nerve conduction and muscle contraction. Manganese is a component of antioxidant enzymes that assist in carbohydrate and protein metabolism. Many rice eaters wonder if brown rice is healthier. Brown rice provides more vitamins than regular white rice. In addition to thiamin and magnesium, brown rice contains selenium, which influences thyroid function and is important in antioxidant enzymes. Brown rice has about seven times more fiber than white rice. One cup of cooked medium grain white rice contains 0.5 grams of fiber, whereas one cup of cooked brown rice contains 3.5 grams of fiber. Per cup, brown rice has 25 fewer calories and seven grams fewer carbohydrates than white rice. How is brown rice processed differently than white rice? All rice is originally brown and whole-grain with the bran attached. White rice is produced by pearling. During the pearling process, the grain passes through a machine where it is rolled and the bran is gently "pearled" off, leaving the white kernel intact. This makes the grain a processed, refined grain and it is no longer a whole grain. Pearling also lowers cooking time and extends the shelf life of grains. Whole-grain brown rice retains more fiber, vitamins, and minerals. What is the best way to store rice? Once rice is cooked, store it in the refrigerator and use it within three to four days. You will know if your rice has gone bad if it is hard and dry or if it has an unpleasant smell. Store white rice in an airtight container in a cool, dry place. At temperatures of 70 F or below, rice can be stored for 10 years or more. Brown rice can be stored for about six months in a cool dry place, but if you place it in the freezer it will keep for about one year. Varieties of rice are divided into categories based on the seed size. Rice can be long-grain, medium-grain, or short-grain. Within these varieties, there are also different types of processing. Converted rice, for instance, is parboiled to remove that surface starch. That makes it easier to pearl by traditional hand processes. Converted rice retains more nutrients and cooks a little faster than regular milled white rice. Instant or quickly cooking rice, on the other hand, is fully cooked and then flash frozen. This process removes some of the nutrients and flavor but makes it a very quick cooking rice. Sticky rice is short-grain rice used in many Asian cuisines. It is also known as glutinous rice or sweet rice. It can be ground into flour and used for dumplings and used in making rice vinegar and Japanese sake. Brown rice is a high-fiber whole grain which usually takes longer to cook than white rice. Basmati rice and Jasmine rice are long-grain varieties that have unique flavor and aroma. Wild rice is the seed of an unrelated reed-like aquatic plant. It is typically used as a side dish and has more vitamins, minerals, and fiber than white rice varieties. Wild pecan rice is unique long-grain rice that has a nutty flavor and rich aroma. Rice can be incorporated into most meal plans, even those that restrict calories and carbohydrates. The key to eating rice is to manage your portion. One serving of cooked rice is about one-third cup. If rice is served as the only starch at your meal, aim to keep your portion to about two-thirds cup to three-fourths cup cooked rice. Eating large quantities of rice can lead to excess calorie and carbohydrate consumption. Carbohydrates are converted to glucose in the body and any excess is stored as fat. Refined, processed carbohydrates can cause blood sugar to rise quickly, resulting in an increase in insulin levels in response. For people with diabetes or insulin resistance, this can be problematic. Short-grain rice tends to have higher glycemic index than long-grain, medium-grain, and brown rice. This means that it raises blood sugars faster. Choose whole grain brown rice when possible as it has more fiber, vitamins, and minerals. The bran is still attached and the seed is intact. Avoid instant or quick cooking rice when possible as this type of rice removes some of the nutrients and flavor. Some people rinse rice before cooking. Most American-grown rice is clean and free of insects. It does not need to be rinsed unless the package recommends rinsing or soaking. The standard ratio for cooking rice is two parts liquid to one part rice. However, this can vary depending on the variety and the type of rice. Check the package label for exact guidelines. One cup of raw, uncooked rice generally yields about three to four cups cooked. Use rice as a side dish, accompanied by vegetables or to complement stews, curries, and soups. Rice can also be used in making puddings, bread, or as an addition to salads. According to reports, rice is one of the most common triggers for FPIES, or Food Protein-Induced Enterocolitis Syndrome. The condition is an inflammation of the small and large intestine. Symptoms include gastrointestinal distress such as vomiting, diarrhea, and in severe cases even shock. It is also possible to experience symptoms of allergy to rice if you are allergic to corn, according to medical experts. Glycemic Index and Diabetes. American Diabetes Association. http://www.diabetes.org/food-and-fitness/food/what-can-i-eat/understanding-carbohydrates/glycemic-index-and-diabetes.html. Labensky SR, Hause AM, Martel P. On Cooking: a Textbook of Culinary Fundamentals. Boston: Pearson; 2015. How Nutritious Is Butternut Squash?